It is hard to find a place more suited to water sports than the mystical Lakshadweep islands. It seems as if these islands were brought out from the depths of ocean just for people to enjoy the water sports. The allure of the deep blue lagoons is simply too much to resist. The warm and unruffled waters prove to be a virtual paradise for indulging in all kind of water sports. Snorkeling and scuba diving are the most preferred water sports at Lakshadweep.Even if you are not an expert swimmer, don’t worry; the lagoons here are pretty shallow and predictable, thus making it easy even for novice and non swimmers. There are training centers on many islands providing professional help and safety measures for the tourists to enjoy water sports at Lakshadweep. Travel to Lakshadweep and set yourself free! 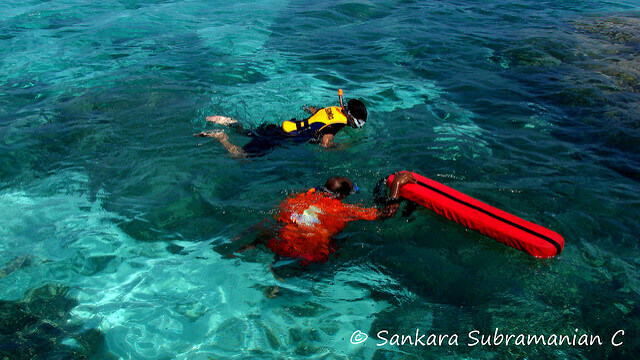 Snorkeling is the most widely indulged in activity on Lakshadweep beaches. The facilities provided here for the sports are unmatched anywhere else in India. Get to know the coral life from close quarters. Bangaram Island and Kadamat Island are the ideal spots for snorkeling in Lakshadweep Islands. What better way to spend a quality holiday than diving into the cool and refreshing water of Lakshadweep lagoons. Scuba Diving in Lakshadweep is truly an amazing experience with clear water and well settled bed adding to the magical experience of the adventure. The lagoons around Kadmat Island are the best place for this sport as they are not as populated as other beaches. Kadmat and Kavaratti islands have a water sport training institute that offer all the facilities and equipments necessary for scuba diving. Surfing is still in its nascent stage in India. Not many destinations provide full facilities for surfing here. However, there are few places in Lakshadweep that have developed sound infrastructure for all water sports including surfing. The lagoons around Kadmat island are the most preferred by tourist as the water here is predictable and offers a safe option for surfing. The presence of training institute in Kadmat and Kavaratti islands has also helped them grow as a water sport destinations. A trip to Lakshadweep is a must if you love adventure! Your Lakshadweep tour seems incomplete without indulging into a couple of water sports at Lakshadweep. Plan your trip now!